Durante o ano, com as mudanças de estação, também a nossa pele pede mudança de cuidados adaptadas às necessidades. Em geral, o inverno, devido aos ventos gelados e cortantes, deixa-nos a pele mais seca e com tendência a gretar e até mesmo a abrir feridas. Não é segredo que sou fã dos cremes hidratantes da Vichy (Podem ver AQUI uma review do Aqualia Thermal para peles secas). Por isso não podia deixar de aproveitar as promoções de inverno e trouxe comigo esta caixa da Vichy. Pelo preço normal do creme veio comigo de oferta uma Pureté Thermale solução micelar + uma miniatura do Vichy Aqualia Thermal. During the year, with seasonal changes, our skin also calls for a change in care adapted to the new needs. In general, in winter, due to cold and freeze cutting winds, our skin driest and is prone to crack and even open small wounds and cuts. It is no secret that I'm a fan of Vichy moisturizing creams (You can see HERE an Aqualia Thermal review for dry skin). 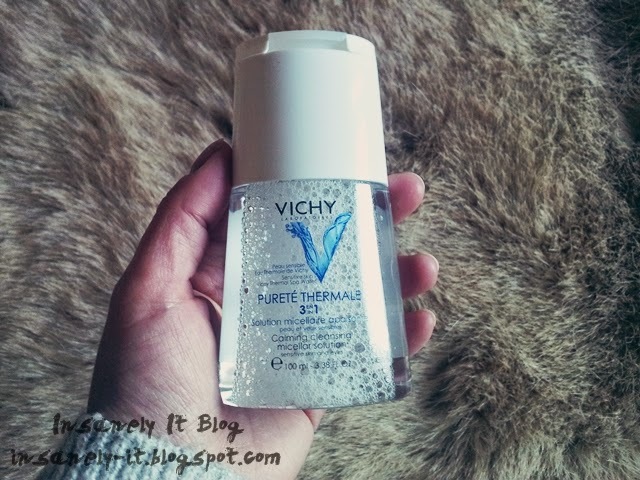 I could not help but enjoy the winter promotions and brought with me this Vichy box. 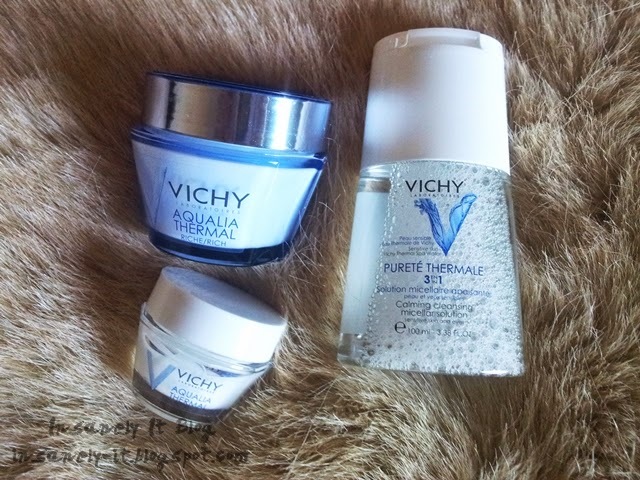 The normal price cream came with two wonderfull offers: one Pureté Thermale micellar solution + a miniature Vichy Aqualia Thermal. Não é a primeira vez que uso cremes da gama Aqualia Thermal. Porque no inverno a minha pele fica mais seca e sensível, desta vez trouxe o Vichy Aqualia Thermal para peles secas a muito secas. O creme é um pouco mais gordo que o de peles secas mas absorve bastante bem e rápido desaparece aquela sensação de pele gordurosa. De oferta vinha uma miniatura de 15ml do mesmo creme, também em embalagem de vidro o que para mim é óptimo. Como viajo muito principalmente de avião, a partir de agora posso levar o meu creme sem me preocupar com a quantidade de líquidos que vão na mala de mão. Quando o creme terminar, posso sempre lavar o frasco e abastecer-me com a ajuda de uma colher ou espátula. It is not the first time I use creams from the range Aqualia Thermal. 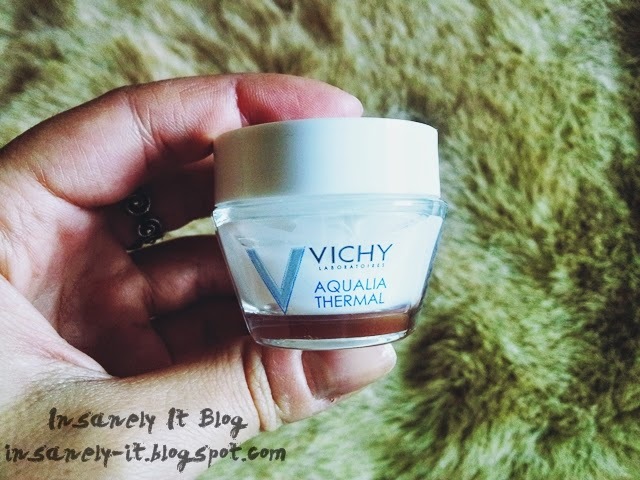 Because in winter my skin is dryer and sensitive, this time I brought the Vichy Aqualia Thermal for dry to very dry skin. The cream is a little fatter than the dry skin one but absorbs fairly well and quickly disappears that feeling of greasy skin. A miniature of 15ml of the same cream also came in glass packaging which for me is great. As I travel a lot especially by plane, from now on I can take my cream without worrying about the amount of liquids that go in the handbag. When the cream finishes, I can always wash the bottle and refill with the help of a spoon or spatula. Este produto é que foi uma surpresa para mim. Nunca tinha experimentado uma água micelar e a verdade é que, depois de ler muito sobre o assunto, estava um pouco reticente. Apesar da publicidade a este tipo de produtos, vi que muita gente era da opinião que as águas micelares eram apenas um esquema desonesto para vender embalagens de 100ml de água por 10€ ou mais. Como estava errada! A solução micelar Pureté Themal 3 em 1 limpa a pele, tonifica e hidrata acalmando as peles mais sensíveis. É feita com água das termas de Vichy por isso mal não faz! É uma solução de limpeza e hidratação suave que tenho usado diariamente após aplicar o desmaquilhante. E meninas, quando eu pensava que o desmaquilhante me tinha deixado a pele imaculada e era o suficiente, heis que passo um algodão com água micelar na pele e este não sai branco! A partir de agora não vivo sem a minha solução micelar e sei que a minha pele fica realmente limpa e hidratada. E vocês, já experimentaram algum destes produtos? This product was a surprise to me. I had never tried out a micellar water and the truth is that, after reading much about it, I was a little reticent. Despite the advertising of such products, I saw that many people were of the opinion that the micellar water was just a dishonest scheme to sell normal water in 100ml packaging for 10 € or more. How wrong! For starters, the Pureté Thermale micellar solution cleanses, tones and hydrates the most sensitive of skins. It is made with water from the Vichy springs so it isn't bad for your skin! It is a mild cleaning solution and hydration I have used daily after applying the usual makeup remover. And girls, when I thought that my daily cleansing routine had left my skin immaculate and that it was enough.. well, I passed a bit of cotton embedded with the micellar solution on my skin and it wasn't left white! From now on I can not live without my micellar solution and now I know my skin it completely clean, soft and hydrated. 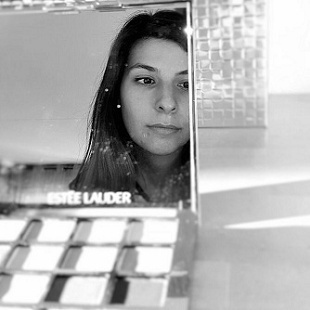 Have you ever tried out any of these products? 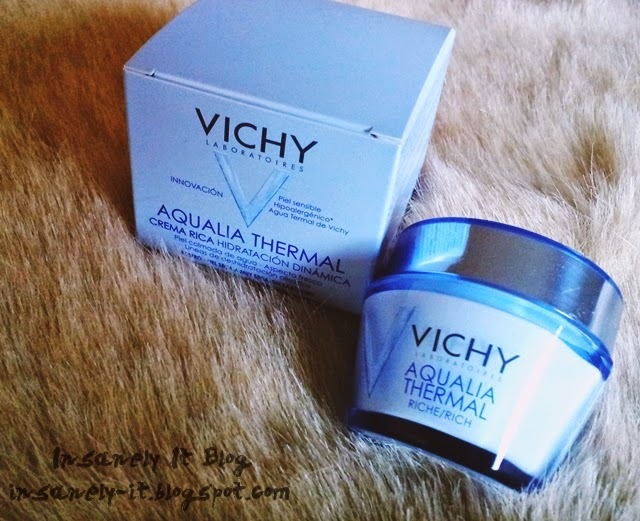 I've always wanted to try Vichy's aqualia thermal and after your wonderful review I totally will! Great post! Ainda não experimentei nada da Vichy, mas deve ser brutal! I love Vichy products, and this is also my fav too.